Even with treatment, 5-year survival rates average 17% for patients with early disease and 4% for patients diagnosed with metastatic disease.1,2 Current chemotherapies work by acting non-selectively, targeting cell division or cell suicide pathways to encourage tumor cell death.5 Targeted agents inactivate specific mutated proteins that confer growth advantages to the tumor; however, only a percentage of patients express these mutations, ie, 10%–15% for EGF receptor mutations and 2%–7% for ALK mutations.6–9 In contrast, immunotherapies are designed to restore, stimulate, or enhance the ability of the immune system to recognize and eliminate tumors, and in initial trials, immunotherapies have shown activity in NSCLC and other cancer types.10–14 Herein, new therapeutic approaches for NSCLC are reviewed, focusing on immunotherapy. The immune system primarily functions to protect the body from damage caused by pathogens. However, the immune system also serves to detect and eliminate aberrant cells, including cancer cells, which could potentially cause harm.15 This is evidenced by the finding that patients with reduced immune function as a result of acquired immune deficiency syndrome or chronic immunosuppression have increased rates of malignancy.16 T-cells eliminate tumors by recognizing aberrant proteins presented by cancerous cells, and coordinating an immune response against them.15 Immune responses, whether against tumor cells, infected cells, or as a result of autoimmunity, can damage healthy tissue if left unchecked. To protect against this, the immune system has multiple mechanisms to downregulate immune responses – collectively known as immune checkpoint pathways. Some tumors evade immune responses by exploiting immune checkpoint pathways and other regulatory mechanisms (Figure 1).18–23 A better understanding of these immune evasion strategies has given rise to novel immunotherapies that can restore the patient’s own immune system to respond to and eliminate cancer cells. These immunotherapies re-engage and allow T-cells to function appropriately against tumors. Figure 1 Immune evasion or immunosuppressive strategies used by tumor cells. Notes: Tumors use numerous strategies to evade immune responses.18–23 (A) Cancer cells can downregulate expression of MHC molecules that present tumor antigens to T-cells, and suppress tumor antigen presentation by professional APC, thereby avoiding recognition by T-cells. (B) Tumors create an immunosuppressive environment by recruitment and retention of suppressive Tregs and MDSCs, or (C) by secretion of immune-regulating or suppressive cytokines (IL-4, IL-5, IL-6, IL-10, and IL-13 and transforming growth factor-beta) and mediators (prostaglandins, indoleamine 2,3-dioxygenase. 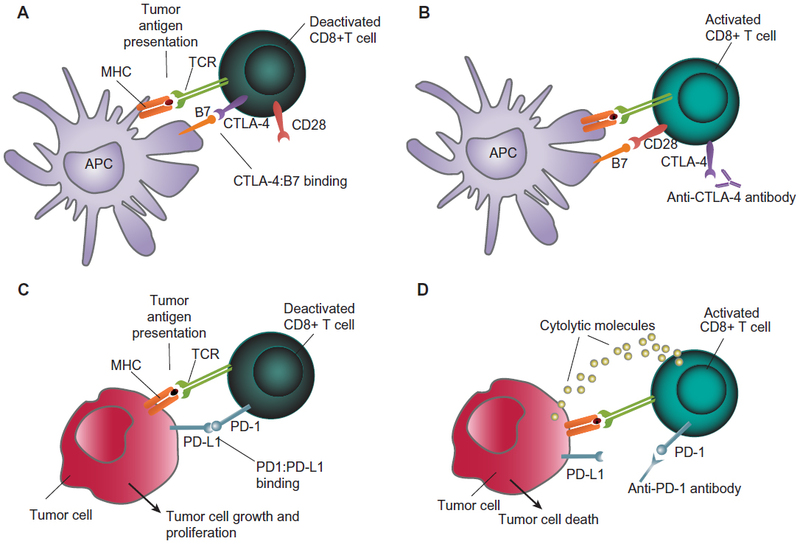 (D) Dysregulation of T-cell checkpoint pathways, including expression of PD-L1 by tumors, sends negative signals to tumor-specific T cells, causing T cell inactivation. Abbreviations: APC, antigen-presenting cells; IL, interleukin; MDSCs, myeloid-derived suppressor cells; MHC, major histocompatibility complex; Tregs, T-regulatory cells. Historically, NSCLC has not been considered sensitive to immune-based therapies; however, data show lung tumors are recognized by the immune system, and a more robust antitumor immune response is associated with better survival. In clinical studies, higher numbers of tumor-infiltrating CD4+ T-cells, CD8+ T-cells, natural killer cells, and/or dendritic cells have been associated with improved patient survival.28–33 Nevertheless, the poor outcomes in NSCLC indicate that in many cases, the immune system is ultimately unable to completely destroy cancerous cells. This may be due to an immunosuppressive environment created by lung tumors, that hinders the ability of the immune system to eliminate NSCLC.20,34–39 The observation that the immune system can recognize and respond to lung tumors, but is countered by immunosuppressive effects of the tumor, suggests that immunotherapies could work by harnessing the natural ability of immune cells to recognize and respond to lung cancer cells. Figure 2 Targeted therapy approaches in NSCLC. Targeted therapies work by inactivating proteins essential for tumor growth and survival. Both EGF receptor tyrosine kinase and ALK can be mutated and overactive in some patients with NSCLC, although not typically in the same patients. Erlotinib and afatinib inhibit the tyrosine kinase on the intracellular region of the EGF receptor and prevent growth signaling. Crizotinib inhibits the kinase activity of ALK, located in the cell cytoplasm, to prevent growth signaling. 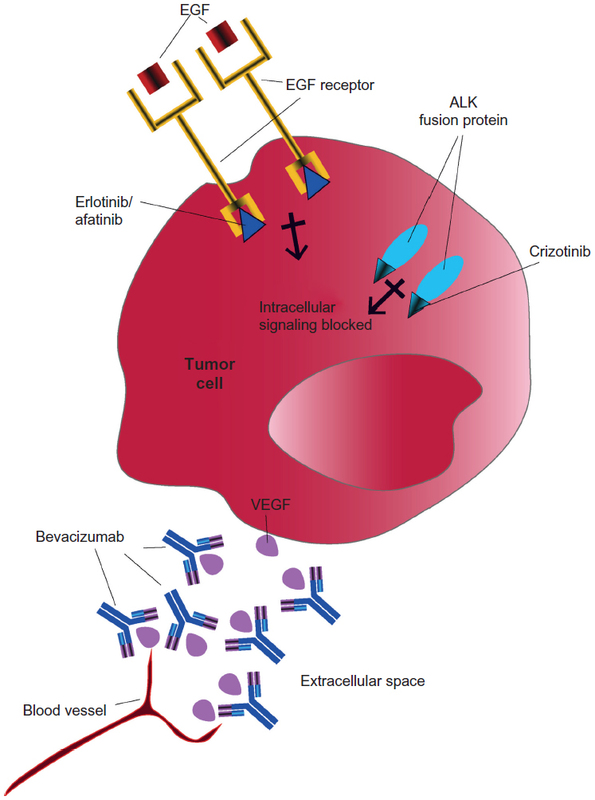 Bevacizumab binds and inactivates vascular endothelial growth factor (VEGF) secreted by the tumor into the intracellular space, thereby limiting blood vessel formation to the tumor. Abbreviations: ALK, anaplastic lymphoma kinase; EGF, epidermal growth factor; NSCLC, non-small cell lung cancer. In contrast, immunotherapy acts on the patient’s own immune system, not the tumor. The therapeutic goals of immunotherapy are to modulate the immune system to recognize and attack the tumor. Strategies to actively enhance the immune response against NSCLC include vaccination to stimulate antibody and T-cell responses to cancer cells and use of immune checkpoint inhibitors to restart T-cell immune responses to NSCLC cells. Many vaccines for NSCLC have reached the Phase II or III trial stage of development, the majority of which pair cancer-associated antigen(s) with an immune-activating compound. Mucinous glycoprotein-1 (MUC1) is another tumor-associated antigen that is commonly expressed in NSCLC, and often aberrantly expressed or glycosylated.50 Two MUC1 vaccines, L-BLP25 and TG4010, have shown evidence of activity in clinical trials, and are being pursued in Phase III trials. The EGF receptor is overexpressed in many tumor types, including NSCLC, and signaling through this receptor is associated with cell proliferation, decreased cell death, cell migration, and angiogenesis.4,58 A vaccine (CimaVax-EGF) was designed to elicit an antibody response against EGF, an important ligand for the EGF receptor, in order to reduce EGF receptor signaling and limit tumor growth.58 CimaVax-EGF was tested in patients with advanced NSCLC who had finished first-line therapy, and showed significant survival improvement in patients <60 years of age as compared with patients who did not receive the vaccine (median survival 11.6 months versus 5.3 months, P=0.0124). The vaccine was well tolerated, with no grade 3 or 4 adverse events reported.58 A Phase III trial is currently being conducted in the UK, with an estimated completion date in 2015.59 No US trials are ongoing. Whereas vaccines are designed to stimulate tumor antigen-specific immune responses, immune checkpoint inhibitors, in theory, should “remove the brakes” on most T-cell-mediated immune responses. This mechanism of action has the risk of inducing immune-related reactions. In this section, the current data on the activity of immune checkpoint inhibitors in NSCLC are reviewed, followed by separate sections on the incidence and management of select adverse events (adverse events with potential immunologic etiologies that require more frequent monitoring and/or unique intervention) observed with these therapies. The activity of ipilimumab in combination with paclitaxel and carboplatin was evaluated in patients with chemotherapy-naïve advanced (stage 3b or 4) NSCLC.62 Patients were randomized to a concurrent ipilimumab regimen (four doses of ipilimumab plus paclitaxel and carboplatin followed by two doses of placebo plus paclitaxel and carboplatin), a phased ipilimumab regimen (two doses of placebo plus paclitaxel and carboplatin followed by four doses of ipilimumab plus paclitaxel and carboplatin), or a control regimen (up to six doses of placebo plus paclitaxel and carboplatin). Ipilimumab or placebo, paclitaxel, and carboplatin were administered intravenously once every 3 weeks for a maximum of 18 weeks. Patients without progression received maintenance treatment with either ipilimumab (ipilimumab arms) or placebo (control arm) once every 12 weeks until progression, death, or intolerance. Abbreviations: NSCLC, non-small cell lung cancer; WHO, World Health Organization. Blocking the PD-1 pathway is thought to modulate the activity of T-cells that have become nonresponsive after encountering PD-1 ligands in the tumor microenvironment (Figure 3).17,64 There are currently two anti-PD-1 agents in advanced stages of development: nivolumab and MK-3475. Figure 3 Concept of immunotherapy in NSCLC. (A) APCs display tumor antigens and B7 (CD80/CD86) molecules to CD8+ T-cells. CTLA-4 and CD28 are expressed on T-cells and compete for binding to B7. CTLA-4 has a higher affinity for B7 and CTLA-4:B7 binding leads to T-cell deactivation. (B) Anti-CTLA-4 antibodies prevent CTLA-4:B7 binding and allow CD28:B7 binding leading to T-cell activation. (C) Binding of PD-1 on T-cells to PD-L1 (or PD-L2; not depicted) on tumor cells causes T-cell deactivation. (D) Anti-PD-1 antibodies (or anti-PD-L1 antibodies, not shown) prevent PD-1:PD-L1 binding and restore T-cell activation and killing of tumor cells via release of cytolytic molecules. Abbreviations: APCs, antigen-presenting cells; MHC, major histocompatibility complex; NSCLC, non-small cell lung cancer; CTLA4, cytotoxic T-lymphocyte-associated antigen-4. Abbreviation: NSCLC, non-small-cell lung cancer. BMS-936559 is a high-affinity, fully human, PD-L1-specific monoclonal antibody which showed activity against advanced NSCLC in a Phase I clinical trial that included multiple advanced tumor types.75 Five of 49 evaluable NSCLC patients had an objective response; response duration ranged from 2.3+ months to 16.6+ months. Six of 49 patients had stable disease lasting ≥24 weeks, and 31% of patients had progression-free survival at 24 weeks. overall reduced tumor burden in the presence of new lesions. Increased tumor volume followed by tumor shrinkage has been called pseudoprogression. The increased tumor size may be caused by higher numbers of immune cells infiltrating the tumor. Also, as compared with chemotherapy, delayed responses are not uncommon, and likely due to the time it takes to generate effective antitumor immune responses.25,84 The health care provider will need to consider these potential response patterns in patients on immunotherapy when assessing the effectiveness of therapy and making treatment decisions. Immunotherapies stimulate the immune system with the goal of eradicating tumors, and some side effects are likely related to this immunologic mechanism of action. Inhibiting the CTLA-4 and PD-1 pathways will lead to activation of T-cells specific to tumor antigens and potentially to self antigens.11 As such, certain adverse events in patients receiving checkpoint inhibitors differ from chemotherapy-related adverse events. These events are termed select adverse events, and may require more frequent monitoring and/or unique intervention. 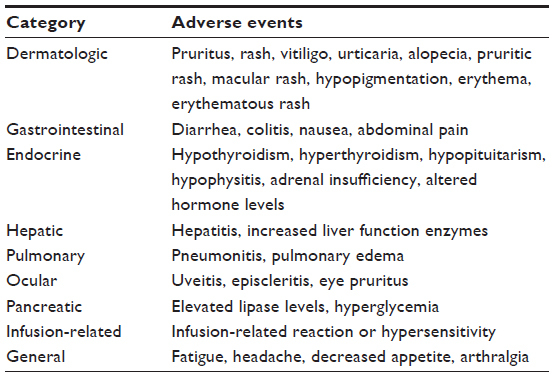 The most common types of select adverse events reported with checkpoint pathway inhibitors are listed in Table 3,12,13,25,62,65,72,73,75,76,85,86 and include gastrointestinal, dermatologic, and endocrine side effects. In clinical studies, select adverse events were reported in approximately 40%–60% of patients, including 3%–20% patients with grades 3 or 4. Select adverse events were reversible in most cases; however, some adverse event-related deaths occurred.12,25,62,65,72,73,75 Differences in the incidence and type of grade 3–4 select adverse events across the different immunotherapy drugs were observed, and newer agents under investigation appear to have a better overall safety profile than ipilimumab. However, additional data are needed to confirm this observation. Onset of immune-mediated side effects is variable and appears to depend on the organ system affected, although many occur during the first treatment cycles. Some, however, occur after a patient has been treated with several cycles. This is in keeping with the immune mechanism of action, as the time it takes to recognize antigens and build a response is inconsistent and may be prolonged. Also, delayed select adverse events can develop after a patient has completed or discontinued treatment, as the immune responses may persist. Thus, it is imperative for clinicians to continue to monitor for potential side effects. referral to specialists, ie, an endocrinologist, pulmonologist, and ophthalmologist. Health care providers, patients, and caregivers should have a low threshold for acting on gastrointestinal symptoms for ipilimumab-treated patients, because the pathology and treatment are different than for chemotherapy-associated diarrhea.86 Similarly, any exacerbation in pulmonary symptoms, even in patients with lung cancer, should be evaluated in patients who have received nivolumab, MK-3475, or other immunotherapy. The evidence suggests that progression to severe events may be avoided through proactive monitoring and early and sustained intervention.86,87 Any potential select adverse event should be treated with a high level of concern. use of replacement therapy for endocrine disorders, specifically thyroid replacement and steroid replacement. It is essential to educate all members of the health care team regarding the introduction of new treatment regimens. The advance practice nurse is involved in the coordination of these education efforts. In our center, education sessions for physicians, advanced practice registered nurses, research nurses, and pharmacists are scheduled prior to the initiation of all new clinical trials to provide indepth education regarding the new therapy. Symptom management algorithms are reviewed during the new therapy planning sessions. Thereafter, the team works closely with the nursing leadership to provide education for the nursing staff, including the importance of frequent symptom monitoring. The advanced practice registered nurse is ideally placed to monitor the patient for physical side effects and to order appropriate diagnostic evaluations for suspected select adverse events. The advanced practice registered nurse is also involved in coordinating the consult services needed for the management of select adverse events. The successful treatment of patients on immunotherapy depends on the diligence of ongoing assessment/identification and management of immune-mediated side effects. Unmanaged select adverse events can mean the discontinuation of potentially beneficial therapy, and in some cases, can be fatal. Immunotherapies represent a novel approach to the treatment of NSCLC, and offer the potential for extended benefits, even in advanced disease. Unlike targeted agents, the efficacy of immunotherapy is not limited to patients with particular mutations, and may have broad applicability. As immunotherapies have novel antitumor effects, such as pseudoprogression, repeat biopsies and/or confirmatory scans may be necessary to inform treatment decisions. Also, unlike chemotherapy or targeted therapy, health care providers need to consider select adverse events for patients receiving immunotherapy. Although select adverse events may not be a familiar concept in oncology clinics, most select adverse events can be managed with awareness and action, and immunotherapy may be maintained or reinitiated following resolution of immune-related adverse events. To ensure that these therapies can be used to their fullest benefit, health care providers should be aware of the unique response patterns and immune-mediated side effects of these agents so that they can make appropriate treatment decisions. Nurses will play a key role as immunotherapies become more common in the clinic, both in treating patients and in the education of patients, family members, and other health care providers. The author takes full responsibility for the content of this publication and confirms that it reflects her viewpoint and medical expertise. The author also wishes to acknowledge StemScientific, funded by Bristol-Myers Squibb, for writing and editorial support. Neither Bristol-Myers Squibb nor StemScientific influenced the content of the manuscript, nor did the author receive financial compensation for authoring the manuscript. American Cancer Society. Cancer facts and figures 2013. Available from: http://www.cancer.org/research/cancerfactsstatistics/cancerfacts figures2013/index. Updated 2013. Accessed October 8, 2013. Molina JR, Yang P, Cassivi SD, Schild SE, Adjei AA. Non-small cell lung cancer: epidemiology, risk factors, treatment, and survivorship. Mayo Clin Proc. 2008;83(5):584–594. National Comprehensive Cancer Network Clinical Practice Guidelines in Oncology (NCCN Guidelines®). Non-small cell lung cancer. Version 2. 2013. Available from: http://www.nccn.com. Updated 2013. Accessed October 8, 2013. Jänne PA, Engelman JA, Johnson BE. Epidermal growth factor receptor mutations in non-small-cell lung cancer: implications for treatment and tumor biology. J Clin Oncol. 2005;23(14):3227–3234. Cepeda V, Fuertes MA, Castilla J, Alonso C, Quevedo C, Pérez JM. Biochemical mechanisms of cisplatin cytotoxicity. Anticancer Agents Med Chem. 2007;7(1):3–18. Paez JG, Jänne PA, Lee JC, et al. EGFR mutations in lung cancer: correlation with clinical response to gefitinib therapy. Science. 2004;304(5676):1497–1500. Shigematsu H, Lin L, Takahashi T, et al. Clinical and biological features associated with epidermal growth factor receptor gene mutations in lung cancers. J Natl Cancer Inst. 2005;97(5):339–346. Thunnissen E, Bubendorf L, Dietel M, et al. EML4-ALK testing in non-small cell carcinomas of the lung: a review with recommendations. Virchows Arch. 2012;461(3):245–257. Garbe C, Eigentler TK, Keilholz U, Hauschild A, Kirkwood JM. Systematic review of medical treatment in melanoma: current status and future prospects. Oncologist. 2011;16(1):5–24. Wolchok JD, Kluger H, Callahan MK, et al. Nivolumab plus ipilimumab in advanced melanoma. N Engl J Med. 2013;369(2):122–133. Wolchok JD, Neyns B, Linette G, et al. 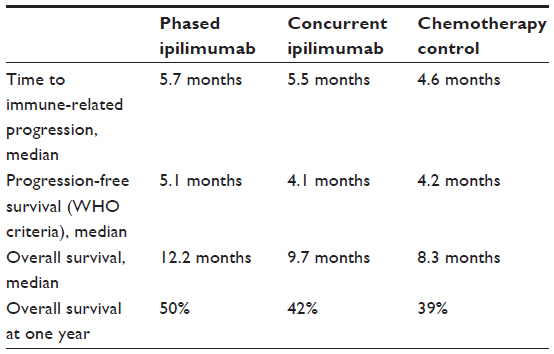 Ipilimumab monotherapy in patients with pretreated advanced melanoma: a randomised, double-blind, multicentre, phase 2, dose-ranging study. Lancet Oncol. 2010;11(2):155–164. Grulich AE, van Leeuwen MT, Falster MO, Vajdic CM. Incidence of cancers in people with HIV/AIDS compared with immunosuppressed transplant recipients: a meta-analysis. Lancet. 2007;370(9581):59–67. Fife BT, Bluestone JA. Control of peripheral T-cell tolerance and autoimmunity via the CTLA-4 and PD-1 pathways. Immunol Rev. 2008;224:166–182. Baba T, Hanagiri T, Ichiki Y, et al. Lack and restoration of sensitivity of lung cancer cells to cellular attack with special reference to expression of human leukocyte antigen class I and/or major histocompatibility complex class I chain related molecules A/B. Cancer Sci. 2007;98(11):1795–1802. Fukuyama T, Ichiki Y, Yamada S, et al. Cytokine production of lung cancer cell lines: Correlation between their production and the inflammatory/ immunological responses both in vivo and in vitro. Cancer Sci. 2007;98(7):1048–1054. Jadus MR, Natividad J, Mai A, et al. Lung cancer: a classic example of tumor escape and progression while providing opportunities for immunological intervention. Clin Dev Immunol. 2012;2012: 160724. Niehans GA, Brunner T, Frizelle SP, et al. Human lung carcinomas express Fas ligand. Cancer Res. 1997;57(6):1007–1012. Petersen RP, Campa MJ, Sperlazza J, et al. Tumor infiltrating Foxp3+ regulatory T-cells are associated with recurrence in pathologic stage I NSCLC patients. Cancer. 2006;107(12):2866–2872. Shimizu K, Nakata M, Hirami Y, Yukawa T, Maeda A, Tanemoto K. Tumor-infiltrating Foxp3+ regulatory T cells are correlated with cyclooxygenase-2 expression and are associated with recurrence in resected non-small cell lung cancer. J Thorac Oncol. 2010;5(5):585–590. Yervoy® (ipilimumab) [package insert]. Princeton, NJ, USA: Bristol-Myers Squibb Company; 2013. Hodi FS, O’Day SJ, McDermott DF, et al. Improved survival with ipilimumab in patients with metastatic melanoma. N Engl J Med. 2010;363(8):711–723. Provenge® (ipilimumab) [package insert]. Seattle, WA, USA: Dendreon Corporation; 2011. Kantoff PW, Higano CS, Shore ND, et al. Sipuleucel-T immunotherapy for castration-resistant prostate cancer. N Engl J Med. 2010;363(5):411–422. Al-Shibli KI, Donnem T, Al-Saad S, Persson M, Bremnes RM, Busund LT. Prognostic effect of epithelial and stromal lymphocyte infiltration in non-small cell lung cancer. Clin Cancer Res. 2008;14(16):5220–5227. Dieu-Nosjean MC, Antoine M, Danel C, et al. Long-term survival for patients with non-small-cell lung cancer with intratumoral lymphoid structures. J Clin Oncol. 2008;26(27):4410–4417. Hiraoka K, Miyamoto M, Cho Y, et al. Concurrent infiltration by CD8+ T cells and CD4+ T cells is a favourable prognostic factor in non-small-cell lung carcinoma. Br J Cancer. 2006;94(2):275–280. Zhuang X, Xia X, Wang C, et al. A high number of CD8+ T cells infiltrated in NSCLC tissues is associated with a favorable prognosis. Appl Immunohistochem Mol Morphol. 2010;18(1):24–28. Takanami I, Takeuchi K, Giga M. The prognostic value of natural killer cell infiltration in resected pulmonary adenocarcinoma. J Thorac Cardiovasc Surg. 2001;121(6):1058–1063. Villegas FR, Coca S, Villarrubia VG, et al. Prognostic significance of tumor infiltrating natural killer cells subset CD57 in patients with squamous cell lung cancer. Lung Cancer. 2002;35(1):23–28. Dasanu CA, Sethi N, Ahmed N. Immune alterations and emerging immunotherapeutic approaches in lung cancer. Expert Opin Biol Ther. 2012;12(7):923–937. Platonova S, Cherfils-Vicini J, Damotte D, et al. Profound coordinated alterations of intratumoral natural killer cell phenotype and function in lung carcinoma. Cancer Res. 2011;71(16):5412–5422. Schneider T, Hoffmann H, Dienemann H, et al. Non-small cell lung cancer induces an immunosuppressive phenotype of dendritic cells in tumor microenvironment by upregulating B7-H3. J Thorac Oncol. 2011;6(7):1162–1168. Schneider T, Kimpfler S, Warth A, et al. Foxp3(+) regulatory T cells and natural killer cells distinctly infiltrate primary tumors and draining lymph nodes in pulmonary adenocarcinoma. J Thorac Oncol. 2011;6(3):432–438. Wang R, Lu M, Zhang J, et al. Increased IL-10 mRNA expression in tumor-associated macrophage correlated with late stage of lung cancer. J Exp Clin Cancer Res. 2011;30:62. Zeni E, Mazzetti L, Miotto D, et al. Macrophage expression of interleukin-10 is a prognostic factor in nonsmall cell lung cancer. Eur Respir J. 2007;30(4):627–632. Hanna N, Shepherd FA, Fossella FV, et al. Randomized phase III trial of pemetrexed versus docetaxel in patients with non-small-cell lung cancer previously treated with chemotherapy. J Clin Oncol. 2004;22(9):1589–1597. Lyseng-Williamson KA, Fenton C. Docetaxel: a review of its use in metastatic breast cancer. Drugs. 2005;65(17):2513–2531. Xalkori® (crizotinib) [package insert]. New York, NY, USA: Pfizer; 2013. Pallis AG, Fennell DA, Szutowicz E, Leighl NB, Greillier L, Dziadziuszko R. Biomarkers of clinical benefit for anti-epidermal growth factor receptor agents in patients with non-small-cell lung cancer. Br J Cancer. 2011;105(1):1–8. Shepherd FA, Rodrigues PJ, Ciuleanu T, et al. Erlotinib in previously treated non-small-cell lung cancer. N Engl J Med. 2005;353(2):123–132. Bang YJ. The potential for crizotinib in non-small cell lung cancer: a perspective review. Ther Adv Med Oncol. 2011;3(6):279–291. Sienel W, Varwerk C, Linder A, et al. Melanoma associated antigen (MAGE)-A3 expression in Stages I and II non-small cell lung cancer: results of a multi-center study. Eur J Cardiothorac Surg. 2004;25(1):131–134. Vansteenkiste JF, Zielinski M, Linder A, et al. Adjuvant MAGE-A3 immunotherapy in resected non-small-cell lung cancer: phase II randomized study results. J Clin Oncol. 2013;43:Abstr 7103. GlaxoSmithKline. GSK1572932A Antigen-Specific Cancer Immunotherapeutic as Adjuvant Therapy in Patients With Non-Small Cell Lung Cancer. Available from: http://clinicaltrials.gov/show/NCT00480025. NLM identifier NCT00480025. Accessed December 11, 2013. Reck M, Vansteenkiste J, Brahmer JR. Targeting the immune system for management of NSCLC: the revival? Curr Respir Care Rep. 2013;2(1):22–39. Butts C, Murray N, Maksymiuk A, et al. Randomized phase IIB trial of BLP25 liposome vaccine in stage IIIB and IV non-small-cell lung cancer. J Clin Oncol. 2005;23(27):6674–6681. EMD Serono. Cancer Vaccine Study for Unresectable Stage III Non-small Cell Lung Cancer (START). Available from: http://clinicaltrials.gov/ct2/show/NCT00409188. NLM identifier: NCT00409188. Accessed December 11, 2013. Merck KGaA. Cancer Vaccine Study for Stage III, Unresectable, Non-small Cell Lung Cancer (NSCLC) in the Asian Population (INSPIRE). Available from: http://clinicaltrials.gov/ct2/show/NCT01015443. NLM identifier: NCT01015443. Accessed December 11, 2013. Quoix E, Ramlau R, Westeel V, et al. Therapeutic vaccination with TG4010 and first-line chemotherapy in advanced non-small-cell lung cancer: a controlled phase 2B trial. Lancet Oncol. 2011;12(12):1125–1133. Transgene. Phase IIB/III of TG4010 Immunotherapy In Patients With Stage IV Non-Small Cell Lung Cancer (TIME). Available from: http://clinicaltrials.gov/show/NCT01383148. NLM identifier: NCT01383148. Accessed December 11, 2013. Nemunaitis J, Dillman RO, Schwarzenberger PO, et al. Phase II study of belagenpumatucel-L, a transforming growth factor beta-2 antisense gene-modified allogeneic tumor cell vaccine in non-small-cell lung cancer. J Clin Oncol. 2006;24(29):4721–4730. NovaRx Corporation. Phase III Lucanix™ Vaccine Therapy in Advanced Non-small Cell Lung Cancer (NSCLC) Following Front-line Chemotherapy (STOP). Available from: http://clinicaltrials.gov/show/NCT00676507. NLM identifier: NCT00676507. Accessed December 11, 2013. Neninger Vinageras E, de la Torre A, Osorio Rodríguez M, et al. Phase II randomized controlled trial of an epidermal growth factor vaccine in advanced non-small-cell lung cancer. J Clin Oncol. 2008;26(9):1452–1458. Bioven Europe. A Randomized Trial to Study the Safety and Efficacy of EGF Cancer Vaccination in Late-stage (IIIB/IV) Non-small Cell Lung Cancer Patients (NSCLC). Available from: http://clinicaltrials.gov/show/NCT01444118. NLM identifier: NCT01444118. Accessed December 11, 2013. Margolin KA, Wong SL, Penrod JR, et al. Effectiveness and safety of first-line ipilimumab 3 mg/kg therapy for advanced melanoma: evidence from a US multisite retrospective chart review. Poster 3742 presented at the European Cancer Congress, September 27 to October 1, 2013, Amsterdam, The Netherlands. Patt D, Juday T, Penrod JR, Chen C, Wong SL. A community-based, real-world, study of treatment-naïve advanced melanoma (AM) patients treated with 3 mg/kg ipilimumab (IPI) in the United States. Poster 3751 presented at the European Cancer Congress, September 27 to October 1, 2013, Amsterdam, The Netherlands. Lynch TJ, Bondarenko I, Luft A, et al. Ipilimumab in combination with paclitaxel and carboplatin as first-line treatment in stage IIIB/IV non-small-cell lung cancer: results from a randomized, double-blind, multicenter phase II study. J Clin Oncol. 2012;30(17):2046–2054. Bristol-Myers Squibb. Trial in Squamous Non Small Cell Lung Cancer Subjects Comparing Ipilimumab Plus Paclitaxel and Carboplatin Versus Placebo Plus Paclitaxel and Carboplatin. Available from: http://clinicaltrials.gov/show/NCT01285609. NLM identifier: NCT01285609. Accessed December 11, 2013. Hamid O, Carvajal RD. Anti-programmed death-1 and anti-programmed death-ligand 1 antibodies in cancer therapy. Expert Opin Biol Ther. 2013;13(6):847–861. Brahmer JR, Horn L, Antonia SJ, et al. Nivolumab (anti-PD-1; BMS-936558; ONO-4538) in patients with non-small cell lung cancer (NSCLC): overall survival and long-term safety in a phase 1 trial. Abstract MO18.03 presented at the 15th International Association for the Study of Lung Cancer World Conference on Lung Cancer, October 27–30, 2013, Sydney, Australia. Bristol-Myers Squibb. Study of BMS-936558 (Nivolumab) Compared to Docetaxel in Previously Treated Advanced or Metastatic Squamous Cell Non-small Cell Lung Cancer (NSCLC) (CheckMate 017). Available from: http://clinicaltrials.gov/show/NCT01642004. NLM identifier: NCT01642004. Accessed December 11, 2013. Bristol-Myers Squibb. Study of BMS-936558 (Nivolumab) Compared to Docetaxel in Previously Treated Metastatic Non-squamous NSCLC (CheckMate 057). Available from: http://clinicaltrials.gov/show/NCT01673867. NLM identifier: NCT01673867. Accessed December 11, 2013. Bristol-Myers Squibb. Study of Nivolumab (BMS-936558) in Subjects With Advanced or Metastatic Squamous Cell Non-Small Cell Lung Cancer Who Have Received At Least Two Prior Systemic Regimens (CheckMate 063). Available from: http://clinicaltrials.gov/show/NCT01721759. NLM identifier: NCT01721759. Accessed December 11, 2013. Bristol-Myers Squibb. A Phase 1/2, Open-label Study of Nivolumab Monotherapy or Nivolumab Combined With Ipilimumab in Subjects With Advanced or Metastatic Solid Tumors. Available from: http://clinicaltrials.gov/show/NCT01928394. NLM identifier: NCT01928394. Accessed December 11, 2013. Sidney Kimmel Comprehensive Cancer Center. Phase II Anti-PD1 Epigenetic Priming Study in NSCLC. (NA_00084192). Available from:http://clinicaltrials.gov/show/NCT01928576. NLM identifier: NCT01928576. Accessed December 11, 2013. Bristol-Myers Squibb. Study of Nivolumab (BMS-936558) in Combination With Gemcitabine/Cisplatin, Pemetrexed/Cisplatin, Carboplatin/Paclitaxel, Bevacizumab Maintenance, Erlotinib, Ipilimumab or as Monotherapy in Subjects With Stage IIIB/IV Non-small Cell Lung Cancer (NSCLC) (CheckMate 012). Available from: http://clinicaltrials.gov/show/NCT01454102. NLM identifier: NCT01454102. Accessed December 11, 2013. Hamid O, Robert C, Daud A, et al. Safety and tumor responses with lambrolizumab (anti-PD-1) in melanoma. N Engl J Med. 2013;369(2):134–144. Garon EB, Balmanoukian A, Hamid O, et al. Preliminary clinical safety and activity of MK-3475 monotherapy for the treatment of previously treated patients with non-small cell lung cancer (NSCLC). Abstract MO18.02 presented at the 15th International Association for the Study of Lung Cancer World Conference on Lung Cancer, October 27–30, 2013, Sydney, Australia. Merck. Study of Two Doses of MK-3475 Versus Docetaxel in Previously-Treated Participants With Non-Small Cell Lung Cancer (MK-3475-010). Available from: http://clinicaltrials.gov/show/NCT01905657. NLM identifier: NCT01905657. Accessed December 11, 2013. Brahmer JR, Tykodi SS, Chow LQ, et al. Safety and activity of anti-PD-L1 antibody in patients with advanced cancer. N Engl J Med. 2012;366(26):2455–2465. Horn L, Herbst RS, Spigel DR, et al. An analysis of the relationship of clinical activity to baseline EGFR status, PD-L1 expression and prior treatment history in patients with non-small cell lung cancer (NSCLC) following PD-L1 blockade with MPDL3280A (anti-PDL1). Abstract MO18.01 presented at the 15th International Association for the Study of Lung Cancer World Conference on Lung Cancer, October 27–30, 2013, Sydney, Australia. Genentech. A Study Of MPDL3280A in Patients With PD-L1-Positive Locally Advanced or Metastatic Non-Small Cell Lung Cancer. Available from: http://clinicaltrials.gov/show/NCT01846416. NLM identifier: NCT01846416. Accessed December 11, 2013. Hoffmann-La Roche. A Study of MPDL3280A Compared With Docetaxel in Patients With Non-Small Cell Lung Cancer After Platinum Failure. Available from: http://clinicaltrials.gov/show/NCT01903993. NLM identifier: NCT01903993. Accessed December 11, 2013. Bristol-Myers Squibb. Safety Study of IL-21/Anti-PD-1 Combination in the Treatment of Solid Tumors. Available from: http://clinicaltrials.gov/show/NCT01629758. NLM identifier: NCT01629758. Accessed December 11, 2013. Bristol-Myers Squibb. A Phase I Study of an Anti-KIR Antibody in Combination With an Anti-PD1 Antibody in Patients With Advanced Solid Tumors. Available from: http://clinicaltrials.gov/show/NCT01714739. NLM identifier: NCT01714739. Accessed December 11, 2013. ClinicalTrials.gov. [homepage on the Internet]. US National Institutes of Health. Updated 2013. Available from: http://clinicaltrials.gov/. Accessed October 8, 2013. Wolchok JD, Hoos A, O’Day S, et al. Guidelines for the evaluation of immune therapy activity in solid tumors: immune-related response criteria. Clin Cancer Res. 2009;15(23):7412–7420. Prieto PA, Yang JC, Sherry RM, et al. CTLA-4 blockade with ipilimumab: long-term follow-up of 177 patients with metastatic melanoma. Clin Cancer Res. 2012;18(7):2039–2047. Herbst RS, Gordon MS, Fine GD, et al. A study of MPDL3280A, an engineered PD-L1 antibody in patients with locally advanced or metastatic tumors. J Clin Oncol. 2013;31 Suppl:Abstr 3000. Weber J. Review: anti-CTLA-4 antibody ipilimumab: case studies of clinical response and immune-related adverse events. Oncologist. 2007;12(7):864–872.